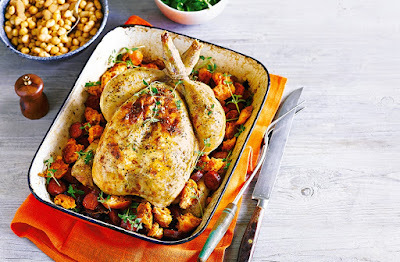 Revamp your roast with this Mediterranean twist on a classic roast chicken - packed with spicy chorizo, zingy lemon and crusty ciabatta croutons, this easy roast dinner is full of flavour and makes the ideal Sunday roast centerpiece. Preheat the oven to gas 6, 200°C, fan 180°C. In a small bowl, squish together the butter, lemon zest and some seasoning with your hands. Using your fingers, gently lift the skin from the chicken breast (starting at the neck end) and rub the butter mixture over the flesh. Return the skin to its original position and smooth it over with your fingers. Transfer the bird to a roasting tin and season all over. Drizzle over the lemon juice and stuff the cavity with the squeezed lemon halves and thyme. Scatter the chorizo around the chicken and drizzle with the olive oil. Roast for 40 minutes, turning the chorizo every so often to prevent it catching. Remove the chicken from the oven and add the ciabatta pieces to the tin, tossing them in the roasting juices. Return to the oven for a further 10-20 minutes, until the chicken is cooked through and the juices run clear when the thickest part of the thigh is pierced with a skewer. Transfer the chicken, chorizo and ciabatta croutons to a warm serving plate, tipping any roasting juices from the bird and tin into a small pan. Skim off most of the fat from the surface, then add the stock. Bring to the boil, then gently simmer for about 5 minutes, or until reduced; season to taste. Carve the chicken and serve with the chorizo, ciabatta croutons, gravy and a little extra thyme.